Oh, my gosh, I am so jealous I can hardly stand it!! In my fantasies, I'm stuffing fabric and a stool into a suitcase and boarding a plane. In real life, I'm sending you lots of great wishes for a wonderful weekend! Oh, I so wished to be one of the twelve but couldn't pull it off at this time. I know it will be a grand event and all will leave with arms and hearts full. I wish you all a very wonderful time. My heart's going a little pitter patter! Two more days!! hope your weekend goes well! x.
Oh how envious I am of your 12 dearies! It would have been so fun to spend the weekend crafting with you! I guess I'll just have to do my thing at home, and be with you in thought. :) Have fun!! 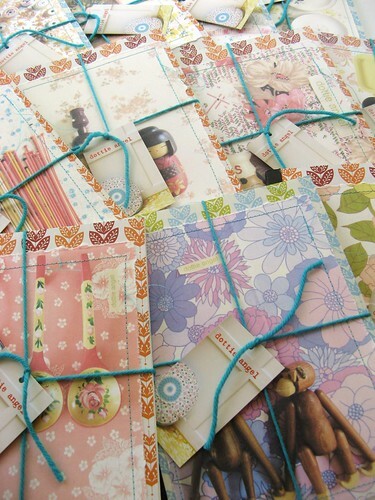 Ooh, I wish I was one of those crafting dearies that was joining you this weekend! I sincerely hope you will do another workshop like this again in the next year or so when my kids are a wee bit older and can make do without me for a few days. I sooo wish I could be there! Just look at all that sweet gorgeousness...I hope you have a wonderful time with all those oh so lucky folk who are joining you for some crafty fun! Have a wonderful weekend with your Dottie Angel Dearies,you will love it and they will definitely love it! I'm sure it will be peachey!I look forward to hearing all about it! I'm thinking praps Miss Ethel might like a dot of oil to soothe her raspy rattle? How I wish I could be one of the dearies on your workshop. Perhaps one day I will be [by the way, you are coming back to live in the UK near me aren't you - ha-ha1]. I'm sure everything will be fine, who could fail to respond to your charm? I hope Miss Ethel recovers soon. i just read about your retreat sounds great. to bad i live too far away. i didn't realize that you have 8 kids. that's great! my hubby came from a big family. but wow, homeschooling them all and being crafty...where do you find the time? oh one last thing, cnn just ran a little segment tuesday about the number of parents homeschooling there kids nowadays. it is up 74% since 2007!! just thought that i would share. good luck this weekend! good great luck to you at your crafty day i wish was on the east coast...please do shoe us all the crafty things ya'll manage to create...can't wait for the pics...! can. not. wait. see you soon!! Tif! 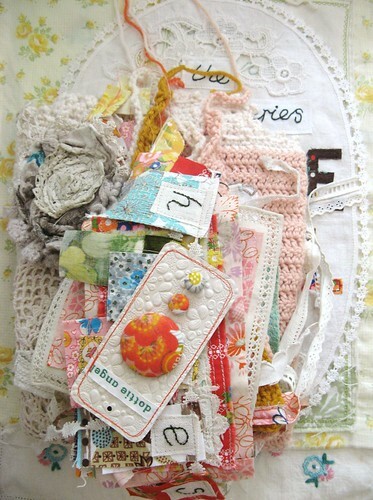 Your piles are making me giddy, knowing that my little piles will soon have friends to play with. Of course, mine are none are too thrilled about the gettin- shoved -in -the -suitcase part, but I'm hoping the excitement will make up for that. See you tomorrow! such pretty piles. i hope miss ethel perks up soon! britt dearest, i fear my profile has confused, it is dottie angel who homeschools 8 children, i on the other hand have only the 4 and they ride the bus every morning! i have nothing but admiration for home schooling mums across the globe, but alas i am not one of them... thank you for stopping by my little blog! finishing up on a few things here at the shed, packing my clothes and to tell the truth, as much as i love my clan, i'm a little 'made up' to be leaving them for a few days to spend time with crafty dearies from america, canada, hawaii and even good old blighty! I sooooo wish I was coming along - I hope it all goes well! 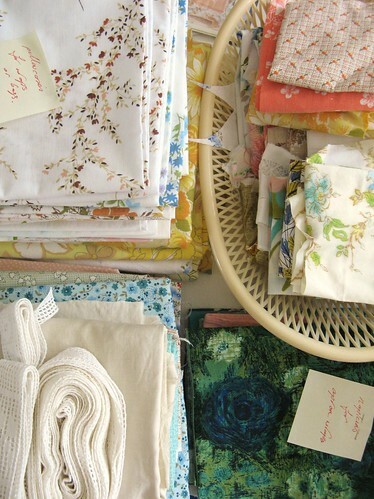 I love the look of those well organised piles of vintage gorgeousness. What wonderful things are on that table and what a delightful thing to do. I love crafting with like-minded friends! I am so loving your blog. Come and visit our blog, if you wish. We are a mom and daughter who make repurposed jewelry, but find that is only one thing that is covered in our blog. 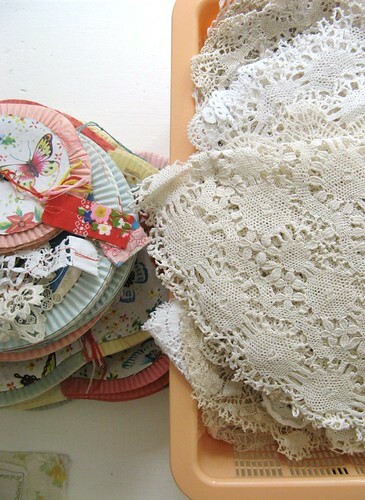 We love bargains, vintage clothing and most all things vintage, paper crafts, fabric crafts, traveling and our two fluffy, sometimes white dogs, Sophie and Harvey. Right now we are in Croatia for our exchange student son's wedding. Such a special time! you have the best piles around. oh how i wish i could be one of your little students- i am os envious of these 12 lucky ones! Love your new header or has it been up a whie now? lovely lovely blog! follow you, kisses.